I had coached Sean’s son in soccer and learned that he built pools. When it came time to build our pool in 2006, I asked around and Premier Pool’s name kept coming up. I ended up choosing them for three reasons. First, their quality is unmatched. Second, they build very unique pools that create a backyard paradise. Third, I trusted Peter and Sean and knew they would exceed my expectations. We have a 35,000 gallon pool that has a hot tub with a waterfall that leads to a creek, which finishes at the pool. We have so many people tell us that they have never seen a pool like ours and it’s the best they have seen. I would agree…simply AWESOME. We talked to four or five different pool companies, some that were a little cheaper, but none that impressed us as much as Premier Pools. Peter's creativity was beyond our expectations, and their knowledge about the industry and the options of possibilities were fantastic. That was in 2011 and we couldn't be happier with our pool. We can't wait to have them complete our cabana and finish out our entire backyard! We have recommended them to several people and will continue to do so! I was referred to Premier Pools by my homebuilder. Pool builders tend to come and go but I liked the idea that Premier was a family-owned business that had been around for a long time and enjoyed a great reputation in the community. I can recommend and have recommended Premier Pools without reservation to anyone considering a new pool or any other enhancements to their outdoor environment. We built the pool back in 2006 and their service after the sale has been far beyond my expectations as well. Premier Pools was recommended to us by our neighbors. Our pool is enclosed and we wanted the façade to complement the home’s architecture. We were impressed with the design and materials and Premier’s ability to work well with another contractor. We feel we received very high quality product and the outdoor kitchen and patio area they built were the icing on the cake. That was in 2009 and their follow up service since then has been terrific. We heard about Premier Pools through our homebuilder and through a friend/co-worker. We have a large (approx. 50,000 gal.) saltwater pool that was built in 2007 on a sloped lot that includes a spa with a waterfall edge, grotto, tanning ledge, diving ledge, and negative edge. Every attention to detail was given from the quality construction of the pool, to the decking, brickwork, drainage, sprinkler system, outdoor grill area, and fireplace, and was completed in the timeframe promised. 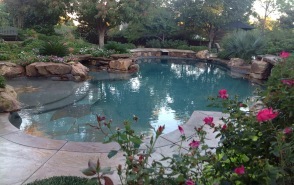 Premier Pools are experts in their field. They design and build an exceptional product. They hire qualified contractors, oversee the entire process, and complete the job with extreme professionalism. They can tackle any job, large or small, and we would highly recommend them to anyone. 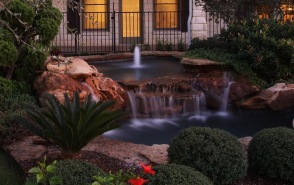 Our next-door neighbor highly recommended Premier Pools and we chose them to build ours in August of 2013. We elected to also put a fire pit adjacent to the Jacuzzi that allows us to sit outside and continue to enjoy the pool in any climate. Premier incorporated the pool, the decking, and other features to migrate into our existing landscaping, patio cover, and outdoor kitchen. It makes it appear as if they were all built at the same time! If you are looking for a family-owned business that provides customer service to their clients as if they are the only clients they have, then Premier Pools is the company of choice! The manager of our homeowner’s association recommended Premier Pools to me and they built my pool in 2003. Peter’s imagination was far and away heads and tails above the rest. Adding a bridge was just way cool and not something that everyone has. Premier’s imaginative design and overall value for the money was impressive. These guys are awesome and have become my go-to people for any work I look to do outside or inside, because if they can't do it themselves, they will point you in the right direction as to who can. We built a clean, free form pool with Premier at our previous home in 2002. Then built two lagoon pools in 2005 when we moved. One is shallow and one is for diving. I love the salt-water experience and the uniqueness of the shapes, which form a natural setting. Sean, Peter and Tommie were prompt and paid attention to all the details. The natural feel of the pools and everything else was cooler than I anticipated. I thought it was going to be a nice pool but instead, we now have a resort pool in our backyard. We were referred to Premier Pools by a business contact. We chose them based on their reputation and creativity. We built two pools, one play pool and one lap pool connected by a spa and two fountains. Tommie, Peter and Sean were very flexible and great guys to work with and extremely likable. The quality of their product and the class with which they conduct themselves lends credibility to their name "PREMIER Pools"
© 2019 Premier Pools, Inc.™ All Rights Reserved.